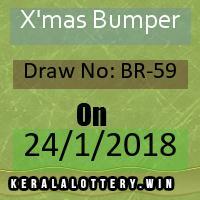 X'mas New Year Bumper BR-59 results as on 24/01/2018 - Today Live Kerala Lottery Results:17/12/2018 "Win-Win W-491"
X'mas New Year Bumper BR-59 Lottery is held only once in an year.. Todays Lottery Results as on Wednesday, January 24, 2018. Kerala Lottery Result today is Xmas bumper BR59 as on 24/1/2018 and is drawn Live starting from 2.00 pm. Result is published officialy in site around 3 .00 pm and we ( http://keralalottery.win ) takes pride in being the first one to publish among all other sites in most easy to read manner. First prize is Rs 6 Crore.. You can see today Wednesday, January 24, 2018 , predicted guessing lucky number based on many factors such as history of Newyear Bumper in previous draws. KeralaLottery Results are also uploaded in video format to Youtube . Subscribe to our youtube Channel at https://www.youtube.com/c/Kerlot . BumperResults of 24.1.2018 can also be seen by downloading our Android App from Play store.